An ORed set of rules at the top of the ACL expression tree, providing two unique properties: cbdata protection and optional rule actions. Definition at line 20 of file Tree.h. Definition at line 48 of file Tree.h. Definition at line 32 of file Tree.cc. References ACCESS_ALLOWED, actions, assert, and Acl::InnerNode::nodes. Definition at line 44 of file Tree.cc. References actions, Acl::InnerNode::add(), assert, and Acl::InnerNode::nodes. Definition at line 53 of file Tree.cc. References actions, Acl::InnerNode::add(), and assert. Definition at line 61 of file Tree.cc. References actions, assert, ACLChecklist::bannedAction(), and Acl::InnerNode::nodes. Definition at line 116 of file BoolOps.cc. Reimplemented in Acl::NotNode, and Acl::AllOf. Definition at line 78 of file InnerNode.cc. Referenced by aclParseAccessLine(), Acl::InnerNode::childrenCount(), Acl::AllOf::doMatch(), Acl::AllOf::dump(), and Acl::AllOf::parse(). Definition at line 23 of file Tree.cc. Referenced by aclParseAccessLine(), aclParseAclList(), Acl::InnerNode::childrenCount(), Acl::AnyOf::parse(), Acl::AllOf::parse(), and ParseAclWithAction(). Definition at line 150 of file BoolOps.cc. References action(), actions, Acl::InnerNode::nodes, and text. Definition at line 110 of file BoolOps.cc. Definition at line 17 of file Tree.cc. 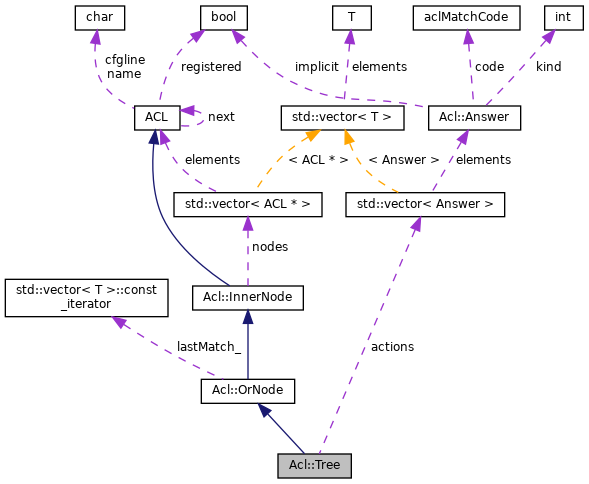 References actionAt(), Acl::OrNode::lastMatch_, and Acl::InnerNode::nodes. Definition at line 49 of file Tree.h. Referenced by actionAt(), add(), bannedAction(), lastAction(), and treeDump(). Definition at line 75 of file BoolOps.h. Referenced by actionAt(), add(), Acl::InnerNode::add(), bannedAction(), Acl::InnerNode::childrenCount(), Acl::AllOf::doMatch(), Acl::NotNode::doMatch(), Acl::AndNode::doMatch(), Acl::OrNode::doMatch(), Acl::AllOf::dump(), Acl::InnerNode::dump(), Acl::InnerNode::empty(), Acl::InnerNode::match(), Acl::AllOf::parse(), Acl::InnerNode::prepareForUse(), Acl::InnerNode::resumeMatchingAt(), treeDump(), and winningAction().